Superior Quality – manufactured and tested to ANSI/UL standards. Amerex is an ISO-9002 registered firm. CARBON DIOXIDE is discharged as a white cloud of “snow” which smothers a fire by eliminating its oxygen. It is effective for Class B flammable liquid fires and is electrically non-conductive. Carbon Dioxide is a clean, non-contaminating, odorless gas, safe for use on clothing, equipment, valuable documents or food. Available in 50 and 100 lb. 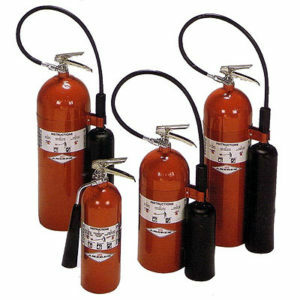 wheeled extinguishers.